Start-up companies come in all forms, including those that are driven by “solopreneurs” – such as an innovative professional service provider, and more life-style companies – for example, an exotic plant nursery or organic bakery. The term “start-up” however is traditionally associated with “venturepreneurs” – entrepreneurs at the helm of high-growth, early-stage technology-oriented ventures. A well-developed and professionally presented Business Plan is essential for a new business to not only guide the entrepreneur but to also attract other people who can create value – be they key staff members, board members, strategic development partners or investors. As the saying goes, “failing to plan is planning to fail”. If a start-up’s value is based on its technology, it is often equally important for the entrepreneur to obtain intellectual property protection for their idea as early as possible. This includes Copyright, Trade Marks, Patents, Web Domains as well as Business and Company Names. As such, it is important for a growth-orientated start-up venture to develop a sound strategy for protecting their intellectual capital from the onset. Getting early advice from a Patent Attorney is essential in order to protect your Intellectual Property (IP) as you develop and grow its value. The typical source of start-up capital is through the founder’s own funds, loans from family and friends, grants from Government programs, support from a larger company and the financial backing of Angel Investors. Angels are High Net Worth individuals who offer the company valuable first-hand experience and industry contacts, in addition to capital. Angel Investors typically take an active role in the operations of the start-up company, exchanging cash for an equity stake and a board position. In practice though, many start-ups are initially funded by the founders themselves and some are fortunate to successfully compete for grants through government funding programs. 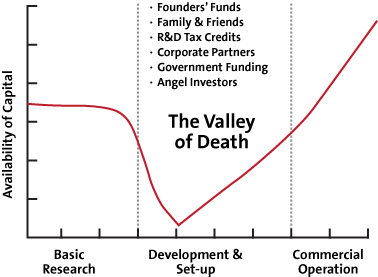 Early-stage Angel investors are generally most attracted to those new companies distinguished by the calibre of the founders, the quality of the business plan, the venture’s risk/reward profile and its potential for scalability. That is, they seek to back an experienced entrepreneur with a successful track-record and a compelling business plan for the future; lower operating costs; moderate to high risk and higher potential return on investment. Early-stage entrepreneurs should typically avoid perusing formal Venture Capital (VC) firms before they have secured the interest of Angel Investors and/or Corporate Investors. The simple reason for this is that the venture will be too underdeveloped and will require too small an investment – usually less than $1.5 million. VC should be a later-stage target when the venture has commercialised the technology and is seeking growth funding – usually in the vicinity of $3-$5 million to be used for market development and sales in international markets. Successful start-ups are typically more scalable than other businesses, in the sense that they have the potential for rapid grow in new or emerging global markets and require limited investment of financial and other resources. Twoeyes has deep experience in working with entrepreneurs in the start-up and high-growth stage. We have started and successfully raised Angel investment, grant funding and Venture Capital in our own entrepreneurial projects – with two successful exits (see Equity Investments) so we know first-hand what it really means to be a Venturepreneur. For a confidential, obligation-free discussion to explore how Twoeyes can help you navigate the Valley of Death and reduce the risks of failure in your start up business, you are invited to contact Twoeyes Managing Director, Conor McKenna, directly on 0402 264 670 or email [email protected].